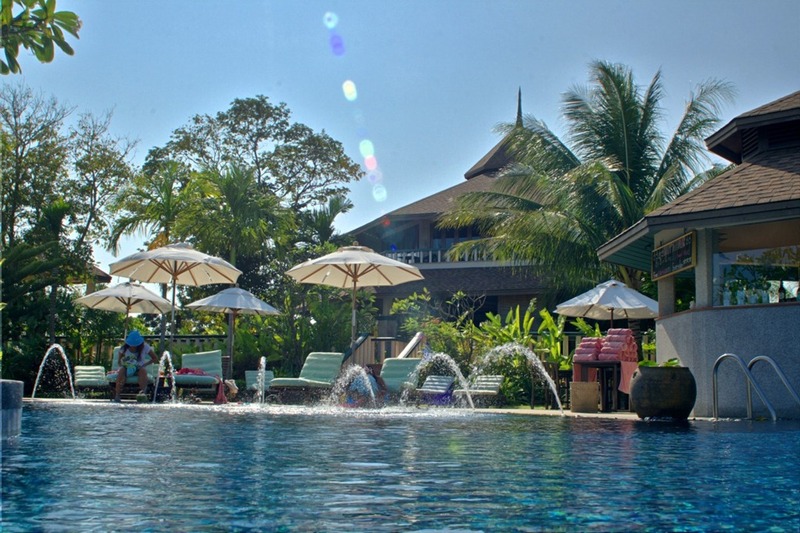 Interval International has affiliated the Golden Tulip Mangosteen Resort and Spa, in Phuket. From its hillside location near Nai Harn Beach, visitors have a stunning 180o panorama of the Andaman Sea, including four bays and the distant island of Phi Phi. Situated on just over five acres (two hectares), Mangosteen Resort is home to Phuket’s only Ayurveda spa. Other on-site amenities underline the organic theme of the resort. The 7,300 square foot (680 square metres) saline swimming pool, with 14 waterfalls set in tropical gardens, is open around the clock. The restaurant’s Asian/Western cuisine uses mostly organic ingredients from small, local farms. The resort also has a fitness centre and an open-air bar and lounge with live music. All 40 split-level, villa-style units are surrounded by foliage that feels like a private garden. They are spacious and include a balcony or terrace with a sea view. Bedrooms have separate sitting areas and some units include whirlpool tubs. High ceilings, locally made furniture, and al fresco bathrooms with large rain showers add to the boutique feel. Other en-suite amenities include cable TV with more than 60 international stations, Wi-Fi, bathrobes, and indoor/outdoor slippers.